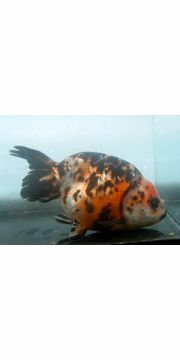 overview The Red & White Ranchu Goldfish is an exceptional example of fancy ornamental goldfish. Selectively bred and highly prized in Japan, the Red & White Ranchu Goldfish is gaining international popularity among goldfish enthusiasts. 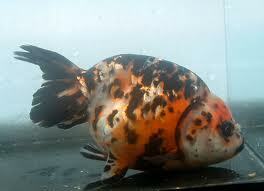 The appearance of the Red & White Ranchu Goldfish is remarkable. Most notable is the absence of the dorsal fin. This distinguishing feature is accentuated by a full, egg-shaped body. A prominent arch in the back terminates downward at a sharp angle for a curved, "tucked-in" body shape unique to the Red & White Ranchu Goldfish. As a branch developed from Lionhead Goldfish, the Red & White Ranchu Goldfish has a full hood that envelops the entire head with a raspberry-like growth. While this wide-eyed beauty may challenge the conventional notion of beauty, its stately presence and graceful nature make the Red & White Ranchu Goldfish an exquisite choice.